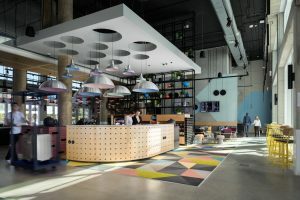 Global Travel Media » Blog Archive » JOHN ROZENTALS finds the new Atura Adelaide Airport hotel an exciting and handy addition in the City of Churches. 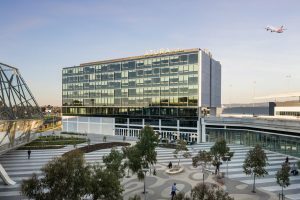 JOHN ROZENTALS finds the new Atura Adelaide Airport hotel an exciting and handy addition in the City of Churches. 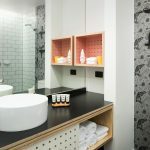 I’ve stayed in a few airport hotels near Sydney’s Kingsford Smith Airport, and inevitably found them a fantastic resource, particularly when catching early-morning flights. But I’ve always had to catch a usually highly reliable shuttle to get from hotel to terminal, and found that it still decidedly beats battling the city’s traffic, whether it be to the airport or to a suburban railway station. 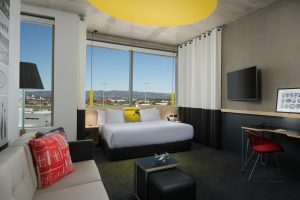 So staying at the very new Atura Adelaide Airport hotel was a definite first — the first time I’d stayed somewhere directly connected to the domestic and international departure desks and well within totally under-over walking distance. Certainly in the prevailing windy conditions which had recently consumed most of south-eastern Australia — and thrown Sydney Airport into total confusion — I was mighty glad not to have to battle the elements in Adelaide. An Atura bedroom … plenty of comfort and, thanks to modern glazing, also quiet. 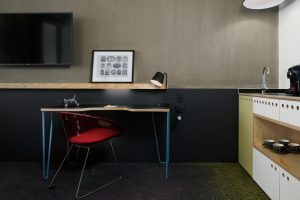 The property may be urban and industrial in its design, but the package works, with free-flowing public spaces linking residential rooms to departure lounges. The check-in desk has a coffee machine and might also be a café. The staff are certainly laid back, though efficiency obviously rules. Pride of place among the public areas, though, must go to the Hangar Bar & Grill, the hotel’s all-purpose restaurant, which is open for breakfast, lunch and dinner. 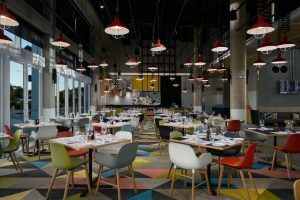 The menu includes some seven different pizzas, plus a range of starters and classics, and a charcoal grill delivering a range of premium steaks plus chicken and salmon dishes. The hotel’s check-in desk … laid-back efficiency the key. Over a couple of visits I tried entrées of salt-and-pepper squid and tuna crudo, the latter comprised of local sashimi tuna, nashi, radish, yuzu ponzu (a umami-rich citrus-based Japanese sauce) and baby coriander. Both were delicious and in servings just the right size for the grill-based main courses to follow — a pasture-fed beef fillet from the NSW Riverina, and a tender-as-you-like scotch fillet from South Australia’s Naracoorte, about 330 kilometres to the south-east. The star of the eating show is, however, a side dish — a dish of charred pumpkin celebrating the flavours of the Middle East and served with cumin yoghurt, honey, pistachio and dukkah. The Atura … modern and arty. The selection of wines available by the glass is good, and I applaud the selection of Running with the Bulls Tempranillo from the Barossa as the house red. It’s hard to beat at $9 a glass — a versatile, food-friendly Spaniard well chosen to accompany red meat of most persuasions. Judging by the wind-blown trees outside the window, I was quite happy to be ensconced in both restaurant and room. Comfort-wise the accommodation is certainly up to scratch in terms of amenity and comfort. I guess my main concern would be the lack of adequate lighting — a common-enough failing. The Hangar Bar & Grill … filling different functions, dawn till after dark. 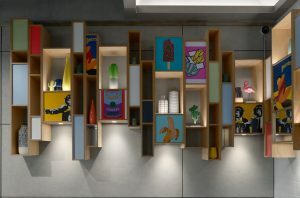 Much of the décor depends on liberal use of ply. It looks great now, but it could easily become frayed over time. Let’s see how it goes. The complimentary wi-fi is a breeze to use and reasonably speedy. The Atura is a great addition to Adelaide Airport, and certainly something that makes handling an early-morning flight simple, if not exactly inviting, especially in conjunction with an inbound flight the afternoon or evening before. And a special thanks to the Virgin baggage staff who were just so willing to help me retrieve a bag I’d completely forgotten a couple of hours earlier on the carousel — even if did concern an opposition airline. Thank you so much. Atura Adelaide Airport … an exciting and handy addition. Disclosure: John Rozentals was a guest of the South Australian Tourism Commission. Atura Adelaide Airport: 1 Atura Circuit, Adelaide Airport; phone 08 7099 3300; visit www.aturahotels.com/adelaide-airport. The Atura … well set up for road warriors.